What Are the Holidays without Bulk Holiday Candy? You know the things you expect for each holiday. Valentine’s Day will bring red and pink heart decorations, St. Patrick’s Day will require lots of green, and Christmas rings in gifts and trees. But what is needed to complete the observations of these holidays? Candy seems to be the missing ingredient. Each of these holidays utilizes candy to some degree. Imagine Valentine’s Day without chocolates, or St. Patrick’s Day without chocolate coins. Meanwhile, the celebrations of Easter and Halloween are simply built around the giving and eating of candy. Ask yourself seriously: what would Easter be without some Reese’s Peanut Butter Eggs or other sugary delights? 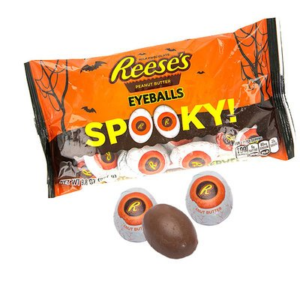 On the same token, how would you like Halloween without tons of chocolatey treats such as Reese’s Peanut Butter Eyeballs falling out of kids’ trick-or-treat bags? So it seems that candy is just the cherry we need on top of each holiday sundae, and not just a few pieces of candy, but lots of it. Especially in the case of Halloween, bulk holiday candy is the way to go, since it’s the best way to maximize the value of your money. You can get a 24-count package of pumpkin Peeps, a bag of Charms Candy Corn Lollipops, or Halloween popcorn balls, all for reasonable prices. Buying in bulk simply makes your Halloween candy shopping easier. You really can’t go wrong with any bulk Halloween candy offerings. All are satisfying in their own ways. Go to BlairCandy.com for all your bulk holiday candy needs.